Theftex, a new independent, retroffitable, flexible, and maitenance-free alarm system with Radiocrafts RC1682-SIG Module embedded available now! Theftex has announced their new theft alarm system with the Radiocrafts RC1682-SIG module inside. Theftex is a retrofittable, effective, and cheap alarm system that pre-charges theft and prevents the theft of movable goods. The alarm system’s application is for tarpaulin superstructures (curtain siders) on trucks transporting goods and plastic containers carrying, for example, automotive and electronic parts. Additionally, the Theftex control unit can be supplied with various cable harnesses and therefore, also be used to protect the rear door of the truck. The special thing about Theftex is that they are completely independent from any electricity network. They have their own power supply that works for up to 12 years. 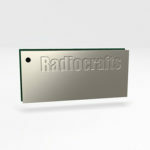 Theftex also has an embedded RC1682-SIG module from Radiocrafts. This module enables communication using the 868 MHz ISM radio band. It is a compact, surface-mounted product that contains a communication controller with embedded SIGFOX protocol software and is pre-certified for operation under the European regulations. Once the alarm is triggered, the customer will be informed via SMS or e-mail (no sim card required). Optionally, the customer can choose to have a 110-decibel alarm siren go off once the alarm is triggered. The siren then stops producing sound after 90 seconds and the system is rebooted automatically. The customer receives the alarm message even when using a GSM Jammer. This way, the truck driver will notice when the goods in the truck are being stolen and he/she can get to safety in good time. Additionally, truck companies who use Theftex get a 50% transport insurance discount from Heveltia Insurance, and no excess in case of damage. The German BAG (Bundesamt für Güterverkehr translated to English as the Federal Office for Freight Traffic) tested the new alarm system and after positive feedback, Theftex is now officially supported by de-minimis meaning their customers can get up to 80% cash-back if they fulfill the BAG-requirements for de-minimis. You can now find Theftex in markets all throughout Europe. You can watch a YouTube video describing the new Theftex alarm system here (in German). For more information on Theftex please visit their webpage here. For more information on the RC1682-SIG module please visit our webpage here where you can also find data sheets and user manuals.